Shiny silver case, black face, silver hands with minimalist silver markers red second hand and premium soft calf leather band in Black. 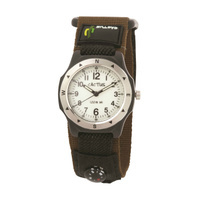 Shiny silver case, white face, silver hands with minimalist silver markers and premium soft calf leather band in Tan. Shiny rose case, white face, rose gold hands with minimalist rose markers and premium soft calf leather band in White.